Perhaps you read the papers every day, and wonder, “What should I look out for? Credit Crisis in China: China, believe it or not, is in more of a credit bubble than the United States. The United States has got lots and lots of problems. But China is actually worse — probably because they haven’t been through this as many times as we have. I think they’re a little naïve about how bad this can get. They’re over relying on the ability of Communist Party officials to keep a lid on it. I was out in the countryside south of Nanjing not too long ago, visiting some of these ghost cities. I was with some Communist Party officials and provincial officials who were behind it all. Everything I saw, construction as far as the eye can see, magnificent stuff, all empty. The stuff you’ve seen on TV, I’ve actually been out there and seen it firsthand. I turned to these guys and I said, “This is all debt finance. This is all empty, so you have no revenue to pay the debt. So how are you gonna pay the debt?” And the guy said, “Oh, we can’t.” But Beijing’s gonna bail us out.” That’s what he said. So it wasn’t even like this is something that might happen. That was, well, that’s definitely gonna happen. But Beijing has their own problems, so whether it’s wealth management products, shadow banking, real estate finance, crony capitalism of the worst kind, flight capital, oligarchs taking all they can like pigs at the trough and then funneling it out to Vancouver and Australia and Park Avenue, etc… and all of this going on on a massive, massive scale… this is going to collapse. And they’re not really ready for it, and they don’t really know how to deal with it. Failure to deliver gold: I think this is almost definitely coming. So much of the gold market is “paper gold.” So much of it is manipulation, and we no longer have to speculate about the manipulation. It’s very well documented. But it all rests on some physical gold. 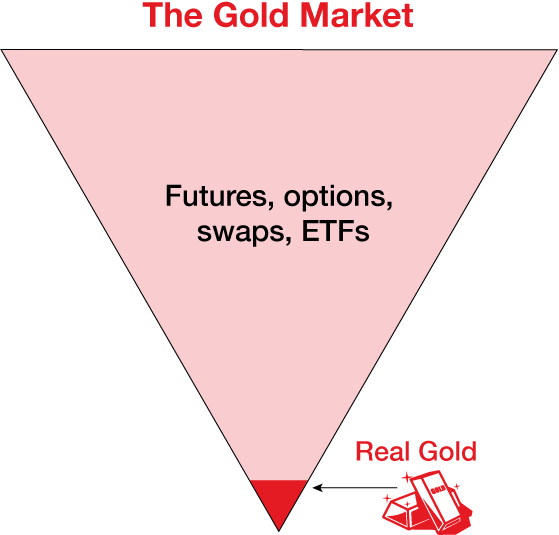 I describe the market as an inverted period with a little bit of gold at the bottom and a big inverted pyramid of paper gold resting on that little physical gold. The [available amount of] physical gold is getting smaller. You would say, “Gee, there’s 2,000 tons of mining output per year, and the gold that exists doesn’t go anywhere, so why isn’t that little brick getting bigger instead of smaller?” And the answer is you have to distinguish between the total supply and the “floating supply.” The total supply gets bigger every year by about 2,000 tons. People don’t throw gold to the bottom of the sea. They don’t blow it up with explosives. They hoard it. And so all that gold’s still around, and new gold keeps coming into the system. So the total supply grows every year, and when you move gold bars from the GLD warehouse in London to the Chinese warehouse in Shanghai, the impact on the total supply is zero. But the floating supply shrinks. Now, what do I mean by the floating supply? The floating supply is the physical gold that is available [to back] paper transactions. When you take gold from the GLD warehouse and put it in Shanghai, there’s no impact on the total supply, but you have shrunk the floating supply. I’ve seen this firsthand. I was in Switzerland not long ago, and I met with Via Mat, which is one of the big four “secure logistics” firms in the world. These are the guys that handle physical metal. He said, “Well, UBS and Deutsche Bank and Credit Suisse, and customers are taking it out of the banks and giving it to us. ” Now there’s another example where the total supply is unchanged, but I’ve now reduced the floating supply because Via Mat is not doing anything with it. They watch it for you. They keep it. UBS, on the other hand, is taking my gold and selling it 10 times over as unallocated gold on a [London Bullion Market Association] forward contract. So how does this end? Someday, probably sooner than later, somebody is going to show up and say, “I want my gold, please,” and the custodian won’t be able to give it to them. What if a major institution like John Paulson’s hedge fund [prompted] a failure to deliver by a major dealer like HSBC or JPMorgan? That would be a shock wave. It would set off panic buying in gold, and inflation expectations would get out of control. 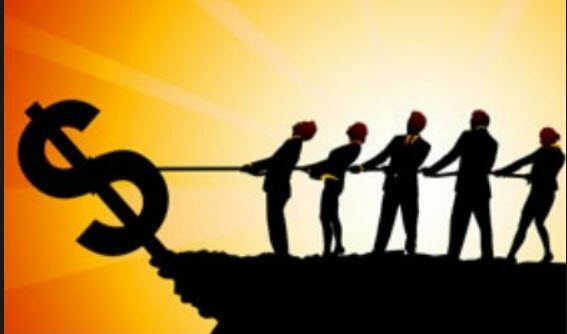 A geopolitical shock: People yawn and say, “Gee, haven’t we had enough of those lately?” But it could be something like an assassination or something much more momentous than what we’ve seen so far. Or one of these things could spin out of control. When Russia invades Crimea, that’s a snowflake. When the Islamic State declares a caliphate, that’s a snowflake. When Libya completely falls apart and they stop pumping oil, that’s a snowflake. I make the point that a snowflake can cause an avalanche. But not every snowflake does. So a lot of snowflakes fall harmlessly, except that they make the ultimate avalanche worse because they’re building up the snowpack. But one of them hits the wrong way and starts something and it spins out of control. And so sometimes people just have this idea that all these things are little things and we’re waiting for the big thing. And that’s actually not good science. The way to think about it is the big thing might not look that different from the little things. It’s just that it hit the system the wrong way. Got you on a bad day. The straw that breaks the camel’s back is no different from all the other straws. It’s just that he was at the tipping point, and one piece of straw broke the camel. One snowflake started the avalanche. So the thing that causes it might not be that different than the stuff we’ve seen, except that the system is getting more and more unstable, and it might not take that much. So with that said, an outright Russian invasion of Ukraine, I mean, that’s kind of been discounted. I think people would be surprised if Putin doesn’t invade eastern Ukraine at this point. And people would be surprised if the Islamic State doesn’t kick the Kurds all the way back to [the regional capital of] Erbil. So then you say, “Well, how bad can get it get?” Well, stay tuned. It can get worse. So I would give you those three: Chinese credit collapse, failure to deliver gold, and the geopolitical shock. And any one of them could start this cascade that I’ve described.